If you are looking for a fantastic way to promote your website, service, product or a blog, article marketing can help you succeed. Article marketing is the process of promoting your website by creating and distributing your content and this is one of the most honest and effective way to raise your website's identity. Here, in this article, you will find 12 successful tips for easy and effective article marketing strategy. Knowing your audience is very helpful in your any type of marketing campaign. With affiliate marketing this comes in handy because you should know what types of products or services to advertise. If your ads are relevant to your audience then you will probably get more click on them. If you are good at writing then let your reader know what you can write for them and if you write content that are engaging and gives results what your readers really need, then it is much more likely to take actions on what you have written. Don't brag to them, but don't hide your experience either. Make sure that you have a great site. Everything on your site should contain well-written content. Your writing is what can really make or break you. If your content does not meet what your visitors are really looking for then you will definitely going to lose your website traffic in future? It a good practice if you include images and pictures to illustrate your article and it attract more attention and your readers will love to have a visual accompaniment to the content they are reading. Be sure that the image you are using is one that you have permission to use. However, you host your images on your own account instead of hot linking. You can also read my article on Beginners guide on how to optimize your website for search engines. If you are trying to advertise your business using article marketing strategy then simply, start by writing down your thoughts. Try to write your articles as if you are having a conversation with the person who will be reading your article, using words like "You" "Yours" and do not bother about thinking about mistakes like your grammar or spelling and when you finish your draft, go back and edit all your mistakes and make clear and understandable. Over time, you will be able to produce a short article in less than half an hour. You can also read my article on how to become a great content writer. If you are really thinking to market your business, then software programs can help you, but you need to research them before choosing one. Compare what all the software programs do, and then figure out just how much you'll save in terms of time. Last, be sure the cost makes it worth your while. Cross linking your articles while promoting your blog or website is a great practice but, you should always make sure to include a links back to your site. This is done in case you are limited to a particular number of links. Bringing potential new readers to your site is the most important thing. You can also read my article on how to build quality backlinks. Check and Recheck your Article for Errors. If your articles are full of errors and mistakes, whether they are due to spelling, grammar or other minor mistakes. You will probably lose a lot of your credibility from your reader if you allow errors slip and go to other sites for better and accurate results. Never use too many keywords in your article. Overuse of keywords will annoy readers and search engine spiders will overlook your content. A safe practice is to limit a particular keyword to four times in the article. Before finally submitting or publishing your article, you need to check your spelling or grammar. Read out loudly what you have written, so that you can hear how it sounds, and catch any simple mistakes you might have made. The more mistakes your article has, the more people will assume you don't really know what you are doing. Try to submit your articles to article directories. Article directories is something that entails advertising your site through publish articles and if the articles content are of good and unique quality, you will get more traffic to your website and article directories includes a box that allows you to post information about you and your site as a sort of promotion. You should always set up a schedule to write and submit new articles in your blog and try to stick to your promise. You may want to aim for a new submission every day or every other day, especially in the beginning as you get used to the process. Being consistent with your quality and quantity, will lead to success in your article marketing campaign. It is entirely possible with article marketing. The most common strategy for article marketing success, though is to combine personal efforts with those of paid contractors. The more money and time you invest in article marketing, the more you will make out of it. If you want to be really successful, create a new article daily, and continually submit them to the top directories. 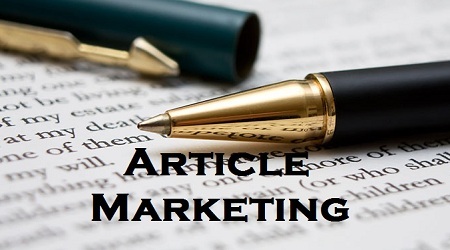 Article marketing might seem risky, because it is fully depended on the quality and effectiveness of the articles you write. As this article has shown you though, putting together an effective and impressive article marketing strategy. With tips like these, you can use articles to increase your website traffic and win your potential visitors.